We've rounded up the latest rental offerings via rental site Zumper to get a sense of what to expect when it comes to locating a place in New York City if you've got a budget of $2,900/month. Here's this one-bedroom, one-bathroom apartment located at 347 W. 55th St., #2C. It's listed for $2,900/month. The building has on-site laundry, an elevator and package service. In the unit, there are hardwood floors, high ceilings, a dishwasher, a walk-in closet and stainless steel appliances. Pet owners, inquire elsewhere: this spot doesn't allow cats or dogs. The rental doesn't require a leasing fee. Walk Score indicates that the area around this address is a "walker's paradise," is quite bikeable and is a haven for transit riders. Next, there's this one-bedroom, one-bathroom apartment over at Union Avenue and North 10th Street. It's also listed for $2,900/month. The building boasts garage parking, outdoor space, a fitness center, a roof deck and an elevator. In the unit, there are hardwood floors, high ceilings, a dishwasher and in-unit laundry. Pet owners, take heed: cats and dogs are allowed. There isn't a leasing fee associated with this rental. Walk Score indicates that the area around this address is extremely walkable, is quite bikeable and is a haven for transit riders. 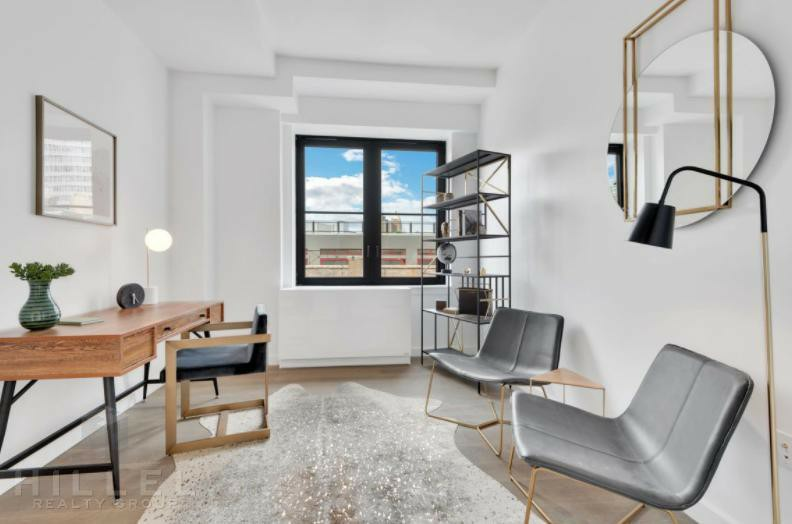 Here's a one-bedroom, one-bathroom apartment at 29-11 Queens Plaza North, #21D that's going for $2,900/month. The building boasts garage parking, outdoor space, a swimming pool, a fitness center and a roof deck. Apartment amenities include hardwood floors, high ceilings, a dishwasher and in-unit laundry. For those with furry friends in tow, know that cats and dogs are permitted on this property. The rental doesn't require a leasing fee. Located at 237 Duffield St., #3D, here's a one-bedroom, one-bathroom apartment that's listed for $2,900/month. The apartment boasts hardwood floors, a dishwasher and stainless steel appliances. The building has on-site laundry, a roof deck, an elevator and on-site management. Animals are not welcome. Future tenants needn't worry about a leasing fee. According to Walk Score's assessment, the surrounding area is a "walker's paradise," is a "biker's paradise" and boasts excellent transit options.